YAROVIV, Ukraine -- US paratroopers have started training national guard units in Ukraine, despite Moscow’s warnings that it could destabilise the peace process with Russia-backed rebels in the east of the country. US and Ukrainian soldiers take part in a ceremony to mark the start of their joint training programme. The move came as 2,000 local and NATO soldiers began exercises in Estonia, which also borders Russia but unlike Ukraine is a NATO member. The exercises are a precursor to joint war games in May involving 13,000 troops. The US and NATO leaderships have promised to increase their military activities in eastern Europe to deter an ever more assertive Russia. 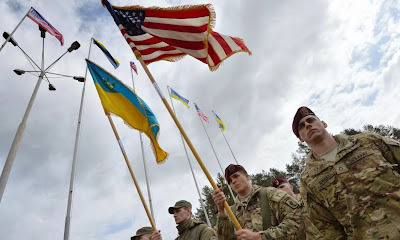 As part of the six-month Operation Fearless Guardian, 290 paratroopers from the US army’s 173rd Airborne Brigade will hold joint exercises with 900 Ukrainian soldiers in Yaroviv near the Polish border. The 173rd Airborne led war games with soldiers from Ukraine, the UK and several former Soviet republics in Yavoriv in September, but this marks the first long-term training programme. At an opening ceremony, the Ukrainian president, Petro Poroshenko, said the training would give a “new face” to Ukraine’s conscript army, which is poorly trained and equipped and was caught out by the pro-Russia uprising that started in the Donetsk and Luhansk regions in April 2014. A fragile ceasefire has been in effect since February, but more than 6,100 people have been killed in the hostilities. “This is the first Ukrainian-American programme at this level, and it shows the transition of bilateral military cooperation into a fundamentally new dimension,” Poroshenko said. He later tweeted a photo of himself flashing two thumbs up alongside members of the 173rd and the US ambassador to Ukraine, Geoffrey Pyatt. The Kremlin condemned the US training mission as a threat to the peace process endorsed by the leaders of France, Germany, Russia and Ukraine in Minsk in February. “The participation of instructors and specialists from third countries on Ukrainian territory, where the internal conflict remains unregulated, where problems with realising the points of the Minsk agreements persist, definitely doesn’t help resolve the conflict,” president Vladimir Putin’s spokesman, Dmitry Peskov, told journalists after the US paratroopers first arrived in Ukraine on Friday. A growing body of evidence suggests that Moscow has backed the rebels not only with arms but with active-duty troops. Last week, Canada announced it would station about 200 troops in western Ukraine from the summer until March 2017 to help train soldiers there. A group of 35 military personnel from the UK began training Ukrainian forces in medicine and defensive tactics in the southern city of Mykolaiv in March. Some have worried the largely symbolic deployment of foreign trainers could lead to an escalation in the conflict. “Canada’s decision is not only provocative to Russia but it’s dangerous,” the retired Canadian diplomat James Bissett told the Ottawa Citizen last week. The US congress has pressured Barack Obama to supply Ukraine with the lethal arms that Kiev has requested, but the president has said he is reluctant to encourage Kiev to try to defeat the pro-Russia rebels militarily. Joe Biden, the US vice-president, spoke with Poroshenko on Monday about the ongoing crisis in eastern Ukraine and offered an additional $17.7m in aid for essentials like food, shelter and water. The pair also discussed Ukraine’s reform efforts, the White House said.